Ah, time it was, and what a time it was. When the Marvel "universe" was still thought of as a single coherent piece, and different writers and editors would not use their books to undercut what was happening elsewhere. Chris and Dave here using Galactus to show how formidable the Earth is in the cosmic scheme of things is a far cry from Galactus-as-punching-back, merely a foil for showing how tough the writer's characters are. Perfect. That's the reaction a Galactus survivor should get! So glad I'm not reading his diminished version. One of the things with which I have grown increasingly annoyed, over the years, is writers using other books' characters to puff up their own. I was shocked, for instance, when I was assigned to WONDER WOMAN, that one of the first things I had to do was practically go to war to prevent the writer of another title having his character "deflower" Diana. If that was going to happen, I said, it was going to happen in her own book. And it WASN'T going to happen. Too many times over the years I have seen writers tear down other people's stories, using their own, unrelated books as platforms. "I don't like that story, so I will undo it!" I never saw those panels before. Very interesting. The lack of respect shown by some to those who came before, including the actual sources, is truly incredible. Basically telling those creators "your stuff is garbage". Do they not realize that what comes around, goes around? And soon your stories will be the ones trampled upon by the next unrespectful lot. All about making a name for yourself I guess. I suspect there are writers now who'd say "Okay!" Oh, come now! There’s many a modern writer who would leap to re-enact portions of PULP FICTION with Batman at center stage. Side note - in my teens I hated Dave's art (just as I hated Kirby's). Now when I see it (and Kirby's) I can't imagine what I was ever thinking! This stuff is GREAT! Of course, I also look back on some of the art that I loved during those times and wonder the same thing...just in the opposite direction! times and wonder the same thing...just in the opposite direction! Those ships are so weird and cool. they had done some, or more ships. I was confronted with a Shi’ar interior just recently. I realized—for the first time—that Dave’s whimsical STAR TREK tribute didn’t really reflect a logical configuration, so I had to put some new thought into it. How big is that bug ship above? Is it a ten person ship like the Falcon, or could it have hundreds of crew like the Enterprise? I love it when a writer is smart enough and respectful enough to put little touches like that in to a story. It also shows an understanding of the sand box they are playing in. 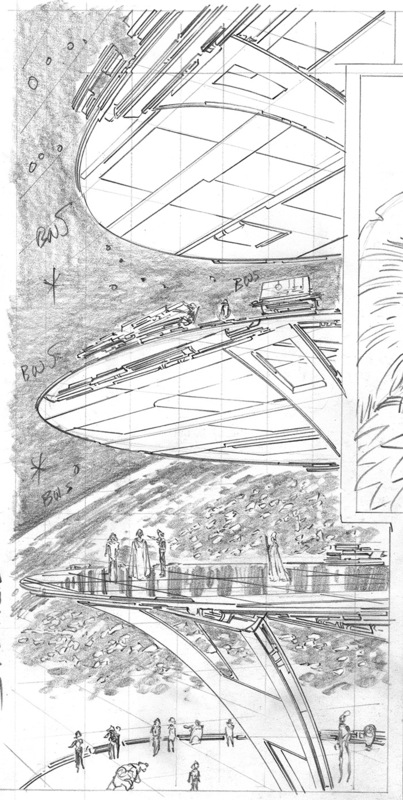 My assumption, based on that bridge scene, was that it was around the same size as the TOS Enterprise. This takes the "eyes" from looking like windshields to truly feeling like massive observation decks. That's a really neat shot. The similar ship that appears in X-MEN #137 has Xavier identify it as an imperial dreadnought. (Heh, he also locates the amphitheater of aliens in judgement as being in the cargo deck, although there's a panoramic view (or mural?) of space overhead.) They've gone against the mile-long Starjammer with no indication of dwarfing or being dwarfted by it. I want to thank you for keeping one smooth tapestry by drawing this ship in #137. (Did you have to work out your own way of drawing it back then?) 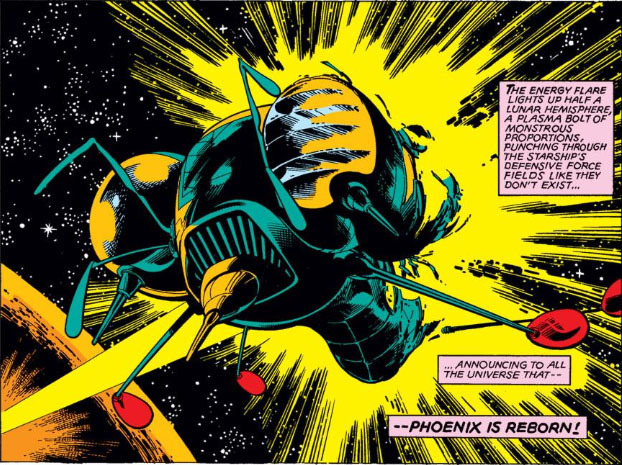 Marvel's alien ships tend to change their design esthetic from issue to issue and from artist to artist, but the legendary nature of that book and the return of Cockrum kept this as the iconic Shi'ar ship for a decade afterward. I took the opportunity to introduce my own design—what I called the “twin boomerang” version—and then promptly blew it up (with Chris doing his best to work in a “Kiss me, Hardy” moment). It was, of course, very much not in the style of Dave’s bug ships, but I drew them, too. Nice, love that interior shot. Wow! Awesome!! Great to see your alien tech design, JB. I cringe imagining that panel disappearing behind Claremont captions—most of them describing the panel! Wonderful conception of the interior of one of those "eyes". You have an amazing knack for 'imagineering' things that haven't been seen before. I'm fumbling around trying to do some sequential illustrations and find I keep reaching for the easy crutch of photo reference...which is very limiting. Thanks for sharing the grandeur of this panel! JB, were you going for a Star Trek the Motion Picture inspired look for the Shi'ar uniforms on the double boomerang.? I didn’t see TMP until 1983.